Created on Monday, December 18, 2006, 19:40:30 and categorized as Political. On today's Potsdam IT Summit a representative of the German ministry of economics has announced that the French-German cooperation for research and development of European search engine technology is history. According to the ministry representative (Hartmut Schauerte) the cooperation "has not been easy". While the French side was trying to develop a European alternative (some people might say a French rival) to the US companies Google and Microsoft, the German side was trying to do fundamental research for the semantic web, without the goal to compete with existing market leaders. For me, being German and (still) studying in France, the situation is totally evident. I hit French-German issues on a daily basis. In my opinion France never got over the fact of no longer being a world power. Many French still think of France like the center of the world. This may be true for wine, but certainly not for world-leading software products. The problem however is totally home-made: how do you want to sell your products world-wide when your code is completely programmed in French? This is the way French engineering students are being educated. And how on earth do you want to succeed on the world markets if 50% of the country's elite students have a less than basic level of English? Try to sell your stuff in French? This obviously does not work, so French companies are mainly focussing the French market. As a matter of fact English is the lingua franca of the IT world. There are some French that have understood and accepted this (maybe) bitter truth, but for the rest it is a mentality thing. People like Chirac (who initiated the project in April 2005) still dream of a world adapting to France, and not France adapting to the world. To me as a grad student who will very soon hold a French and a German degree, at present France is not an attractive place. Closed-minded is a harsh word, but it is pretty much my impression of the French way of understanding the IT market. Starting at engineering schools, and ending at the abandonment of the Quaero project. 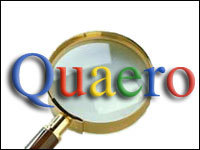 For the ones it is Euro-Google, for the others it is a future semantic web research project. The opinions expressed on this site are my very own, and in no way related to those of my employer (Google).